Let them enjoy the holidays in their healthiest shape. Perhaps one of the worst times to get sick is during the holiday season. Now that Christmas is just a few days away, it's important to make sure you and your children are protected from any infectious diseases. One of the best ways to keep your family, especially your kids, healthy during the festivities, is to boost their immune system. When the "ber" months begin, the cold weather starts, too. Keep your kids warm by making sure they bring a light jacket with them when they leave for school. You can also give them soups for lunch and dinner. Let them drink plenty of water. Don't let your kids take drinking water for granted no matter the time of year. Keeping hydrated will help your kids maintain a properly functioning body system. Make sure your kids get enough vitamin C during the holidays. Choose reliable supplements like FERN-C kidz. 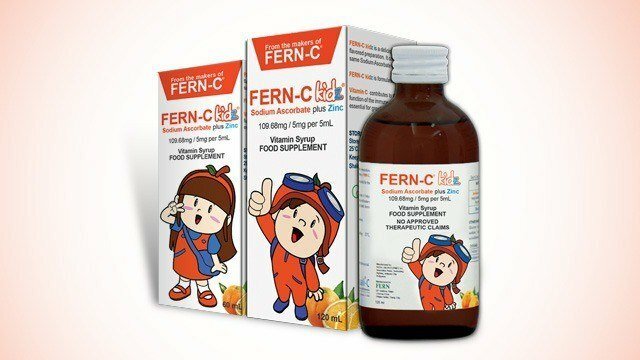 FERN-C kidz uses Sodium Ascorbate, the non-acidic form of vitamin C. This makes FERN-C kidz less acidic as compared to other vitamin C supplements available in the market. Based on the National Center for Biotechnology Information's vitamin C studies, Sodium Ascorbate vitamin C is more reactive in building connective tissues and antibody structures. This means it can be well and easily absorbed by your child's body. This allows your kids to reap the benefits of vitamin C.
The vitamin C and Zinc combination in every bottle of FERN-C kidz is ideal for giving your children a boosted immunity. FERN-C kidz comes in a delicious orange flavor that your children will surely love! It is available in drugstores, supermarkets, and FERN Kiosks nationwide at suggested retail prices of Php62.00 per 60mL bottle and Php119.00 per 120mL bottle. Make sure your children fully enjoy this season's celebrations by giving them FERN-C kidz, your Children's Holiday Health Buddy. This article is sponsored by FERN-C kidz.